Wax Currant is a member of the Saxifrage Family. It grows to 6 feet in height and has light sticky, green leaves covered with fine hairs that have 3 - 5 lobes to 1 inch in width. The plant grows in clearings in pine forests at elevations between 5500 - 9000 feet. 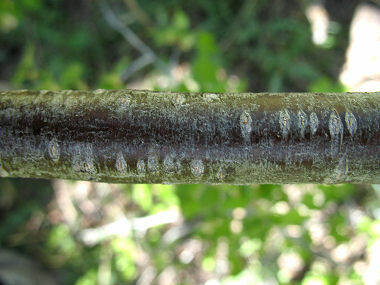 The fruit of the Wax Currant is eaten by birds and mammals while the foliage is browsed by deer and elk. 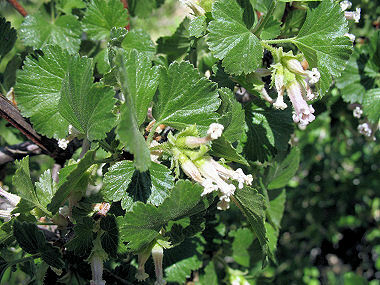 Wax Currant blooms between May - July and produces white or pink, tubular flowers that grow in groups of 1 - 4 to 0.4 inches in length. Flowers are followed by red, sticky fruits to 0.25 inches in diameter.